The natural beauty of Cape Chignecto Provincial Park. Cape Chignecto Provincial Park is one of Nova Scotia’s newest provincial parks, a refuge when you want to get away from it all. 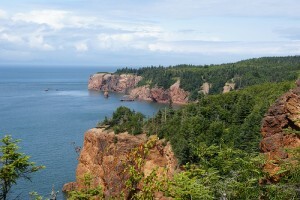 Set on a tip of land that juts out into the Bay of Fundy, there are 50km of hiking trails, often along the coastline, beautiful natural sights like old-growth forests, rare red sandstone formations and the Raised Beach – 200 feet above sea level and formed when glaciers retreated during the last ice age. There are also countless isolated coves, beaches and sea caves. Whether you stay a day or a week, a hike along the cliffs is stunningly beautiful. They rise up to 185 meters into the sky from the water’s edge. From the top, there’s a great vantage point for watching the world’s highest tides flow in and out. What really makes Cape Chignecto special is its status as a wilderness park. That means cars aren’t allowed. If you want to stay the night you’ll have to carry a tent or rent a bunk in a cabin. Don’t forget a campstove to make your dinner! If you don’t want to camp in the park, stay in a nearby B&B. Options include the lighthouse keeper’s home at Cape d’Or or in the fishing village of Advocate Harbour. Even Parrsboro isn’t too far away with its selection of dining and sleeping options. Directions: The park is off Route 209. By car, it’s 1 hour and 30 minutes from Amherst and 2 hours from Truro. A trip here is easily combined with a visit to Joggins, Parrsboro and Five Islands. Opening times: May and November.